The existing AN/TPS-59(V)3 radar system will evolve through a series of product improvements which include technology upgrades, component downsizing and expeditionary mobility modifications. The AN/TPS-59 PIP will continue to provide a long-range surveillance capability to the MAGTF. It also provides a unique capability of tracking and calculating launch points and impact points of Theater Ballistic Missiles. This system will meet the MAGTF surveillance requirement for a 3D expeditionary long range radar during joint/combined operations. The Product Improvement Program (PIP) for the AN/TPS-59(V)3 Radar System is envisioned as a two phase effort. The first phase effort will replace the existing array structure with a new, transportable, light-weight array that uses the existing interface with the AN/TPS-59(V)3 Data Processing Group (DPG)/Control Shelter. The second phase effort will update the software to fully optimize the capabilities of the replacement array and will include a technical refresh of the DPG electronics to eliminate the need for a control shelter. The PIP is envisioned as a single contract award for Phase I with options for the Phase II effort. The system shall be fully compliant with the USAF Three Dimensional Expeditionary Long Range Radar (3DELRR) Capabilities Development Document (CDD) at the completion of the second phase. To ensure program affordability, the replacement array provided during Phase I must be controllable with the AN/TPS-59(V)3 DPG/Control Shelter, while still providing an upgrade path for a 3DELRR capable system during Phase II. The Marine Corps completed an effort to mitigate the risk associated with the development of a system that meets the capabilities of the 3DELRR CDD. The effort was the development of a Composite Material Risk Reduction Array (CMRRA). The CMRRA is a full size mechanical array structure that is transportable via a single seven ton truck. The CMRRA, as built, does not satisfy all of the capability requirements of the 3DELRR CDD. Resource limitations constrained the Marine Corps? ability to develop a fully production representative structure. However, the resultant analysis from the CMRRA effort does indicate that development of a system that is compliant with all requirements of the 3DELRR CDD is achievable. Developmental testing of CMRRA was conducted. 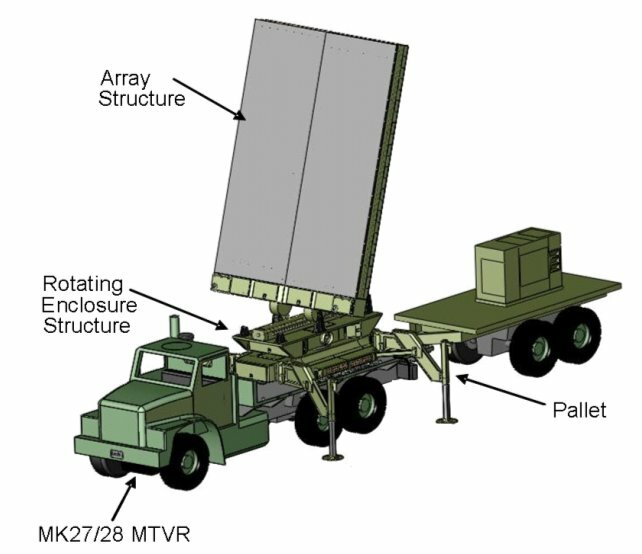 The Composite Material Risk Reduction Radar Array (CMRRRA) was designed and manufactured by Sensis Corporation as Task Direction #13 of USMC Omnibus Contract M67854-05-C-2032. The CMRRRA structure represents an evolutionary step to modernize the AN/TPS-59(V)3 radar - providing enhanced expeditionary capability while addressing service life and obsolescence issues. The CMRRRA concept reduces the transportation and logistical support required to deploy an expeditionary long range radar. The CMRRRA provides two rectangular structures to support array associated electronics. Each structure is mounted to a powered mechanical drive hinge assembly capable of raising each half independently from the vertical (transport/storage) position to the horizontal to form the planar array aperture necessary to achieve the required radar performance. The CMRRRA is designed to provide air flow at a rate of 6451 CFM to each array half to address the convective cooling requirements of array associated electronics. The rotating enclosure houses the array elevation drive system components and provides four electronics bays 40" wide x 14" deep x 20" high for additional electronics to support radar functionality. The CMRRRA pallet structure contains control electronics for the array elevation system, radar structure hinge control system, pallet leg drive and leveling system. The pallet structure accommodates power and mounting for eight fan/air filtration units to provide ambient air flow throughout the CMRRRA structure for cooling of all radar electronics. Respondents to RFI MC2ILEH080001, issued 24 January 2008, were asked to provide the following information: (1) Present a proposed two phase PIP approach that replaces the existing AN/TPS-59(V)3 array with a new array that retains the full functionality of the existing radar system while ensuring the second phase delivers a system that fully satisfies the capability requirements of the 3DELRR CDD. During Phase II, there should only be minimal redesign/rework of the replacement array provided during Phase I. (2) Provide a test strategy to show how you would demonstrate, during Phase I, that the replacement array retains the existing AN/TPS-59(V)3 interfaces and functionality while providing a structure that will support a system that, following Phase II, satisfies the capability requirements of the 3DELRR CDD. (3) Provide an estimate of the cost impacts associated with providing a system using the two phased approach described above. The cost estimate should focus on the Non-Recurring Engineering (NRE) costs that are required during Phase I to ensure a technologically achievable and cost effective solution during Phase II. (4) Indicate interest in using a production representative version of the CMRRA for system development and/or production.